Sort trash and recyclables while keeping them out of sight and out of your way. Easy to install and standing just over 19-inch tall, the simplehuman Under-Counter Pull-Out Recycling Trash Can glides in and out smoothly on a commercial-grade track and frame finished in elegant polished chrome. A convenient pull handle provides easy access without you having to touch the cans, making it a clean, attractive and efficient solution for your home or office. With its slim, minimalist profile and a height of just over 13 in., the simplehuman Step-On Trash Can fits perfectly in tight spots such as under your desk or in the bathroom. A strong steel step pedal provides hands-free convenience, while the durable black plastic lid is designed to avoid showing fingerprints or smudging. Custom handles on the removable inner bucket hold plastic grocery bags securely in place and make it easy to toss them out as needed. The simplehuman Classic Rectangular Step Trash Can was designed for superior durability and a sleek look in stainless steel. Its rectangular shape makes it space efficient, while its internal hinge allows it to fit flat against your wall. This trash can also has a removable plastic bucket for added convenience. A perfect waste solution for your home or office, the simplehuman 38 L Rectangular Trash Can showcases a brushed stainless steel finish with a dent-proof lid in sleek, stylish black. The step pedal smoothly opens the lid with hands-free ease, helping prevent cross-contamination of germs from other surfaces to your trash can. For added convenience, this can also includes a bag tuck feature that keeps any excess bag neatly tucked away for a clean, tidy appearance. 35 L Commercial-Grade Under-Counter Pull-Out Recycling Trash Can Sort trash and recyclables while keeping them out of sight and out of your way. Easy to install and standing just over 19-inch tall, the simplehuman Under-Counter Pull-Out Recycling Trash Can glides in and out smoothly on a commercial-grade track and frame finished in elegant polished chrome. A convenient pull handle provides easy access without you having to touch the cans, making it a clean, attractive and efficient solution for your home or office. 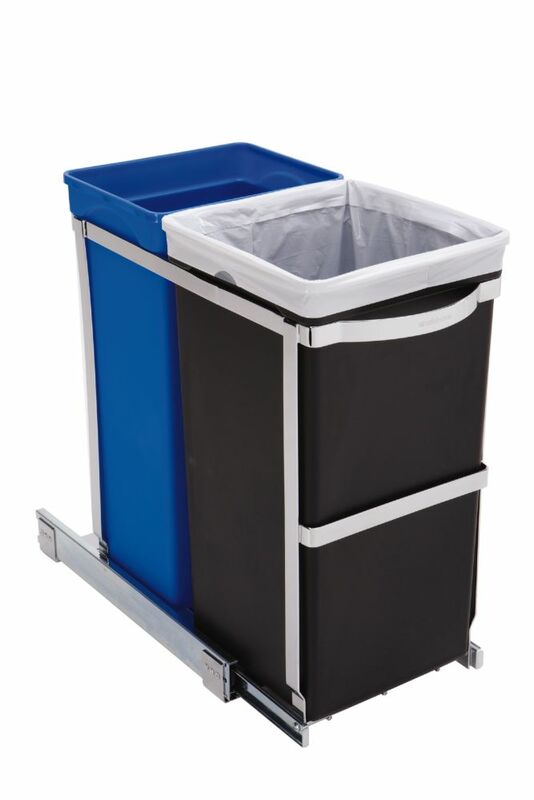 35 L Commercial-Grade Under-Counter Pull-Out Recycling Trash Can is rated 4.6 out of 5 by 34. Rated 5 out of 5 by Helen from Easy to install, well made, slides in and out easily,... Easy to install, well made, slides in and out easily, exactly what I needed. Rated 5 out of 5 by Krasi from We do composting, so this was perfect for our needs.... We do composting, so this was perfect for our needs. I see it being on the small side for the avg American family. Rated 5 out of 5 by Dale from Perfect for a compact area under the kitchen sink.Well constructed.... Perfect for a compact area under the kitchen sink.Well constructed. Smooth to pull out and return. Rated 5 out of 5 by CABA from Great product, perfect size, easy install I bought this for the cupboard beside my sink. According to the space requirement i wasn't sure if it would fit (another model available in store was about half an inch too wide). I'm really glad I bought this because it fits perfectly. Would been better if it came with covers (atlas to for the garbage) and if the track was auto closing. But I still have to give it 5 stars because of how good quality it is, perfect fit and easy to install. Really love the way that this has allowed us to get our waste out of sight, and sort. Rated 5 out of 5 by Lorraine from The dual bins are excellent for conserving space and minimizing... The dual bins are excellent for conserving space and minimizing clutter in my apartment. Accessability is smooth and seamless. I highly recommend this product! The answer to the width of this unit was different In both posted questions. Can you confirm the width of this unit and what size cabinet it will fit into please? What is the minimum cabinet height required to fit this under a sink? What's the minimum width of cabinet that is needed to install this? Thanks in advance. The recycler is 9 inches wide. The minimum cabinet width is 11.5 inches. The depth is 18 inches including the handle.